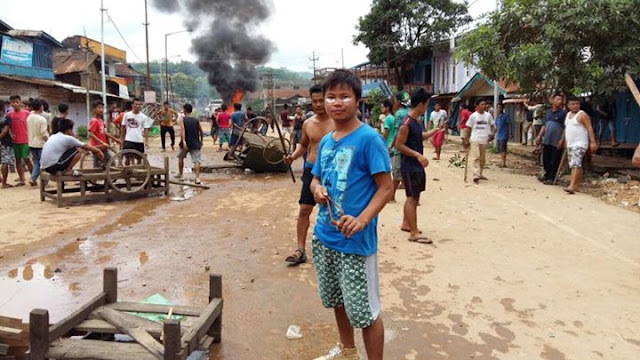 Imphal, Aug 19 : Indefinite curfew has been imposed in Manipur's border town Moreh in Chandel district after miscreants burnt shops and hotels and looted properties during a clash between two groups on Tuesday. The incident occurred when a rally organized by a group in support of Inner Line Permit (ILP) system in Manipur was opposed by Kuki tribals who are a majority here. The Kuki tribals tried to stop the rallying people and pelted stones at them. This snowballed into a clash. The rally was organized under the banner of Joint Committee on Inner Line Permit System (JCILPS) near the Indo-Myanmar border. Later, a mob set ablaze some shops and roadside hotels, police sources said. Six people were injured, but there was no report of any casualty, a police official said. Security forces rushed to the spot to take control of the situation, he added. Additional police forces, led by Inspector General of Police (IGP), have been sent to Moreh from Imphal. Kuki tribals, who opposed the rally, started vandalizing shops, hotels and other business establishments, sources in the police said and added that they had torched an office building, a hotel and two computer shops. Over 50 shops were looted, an policeman said. The situation was brought under control with more police teams reaching the town, he added. Deputy chief minister (Home) Gaikhangam said that the situation was brought under control. The government has sought help from Assam Rifles which has been deployed in Moreh. A team of ministers would visit the town on Wednesday, he added. Three civil society organizations — United Committee, Manipur (UCM), All Manipur United Clubs' Organization (AMUCO) and Kuki Inpi, Manipur (KIM) — appealed to all communities for peaceful co-existence.